Solar Attic Fan Reviews: A Cool Purchase for Your Home? Home > Living > Solar > Solar Attic Fan Reviews: A Cool Purchase For Your Home? Do you want to keep your home cooler in the summer in an eco-friendly way? A solar attic fan can help reduce the strain on your HVAC system, keep your upstairs cooler and modestly reduce your electric bill, all by harnessing the natural power from the sun. And, in some locations, you can even qualify for a tax credit for your purchase. What Factors Should You Consider In An Solar Fan? Before we dive into our solar powered attic fan reviews, we’ll run through a few factors you should think about when choosing the best fan for your home. How Large Is Your Attic? Not all solar attic fans fit every type of roof. Be sure to read the installation details and customer reviews to see which fans will work best for your roof. Most solar attic vents fall into two categories: gable-mounted or roof-mounted. Where’s The Best Place To Mount Your Solar Fan? Ideally, your solar panel should face south (if you live in the Northern Hemisphere) and be in an area where it won’t get shade from trees or nearby buildings during the majority of daylight hours. Cost Savings Tip: Be sure to check with your local municipality to see if you qualify for tax incentives toward the purchase of a solar powered roof vent. We’ve chosen our best solar attic fans based on several factors, including reliability, quality & durability, ease of installation, features, pricing and more. Natural Light wins our top spot as the best solar attic fan. Endorsed by homeowners and builders alike, Natural Light solar fans give you high-quality materials and a 25-year limited warranty to back them up. They include all the hardware needed for installation, and customers report excellent instructions to get the job done within an hour. The Natural Light solar panel is adjustable from flat up to a 45-degree angle, or you can detach it and mount it remotely for best sun exposure. You can also purchase a turret extension and tile roof flashing kit for installations on tile roofs. The Remington Solar Powered Attic Fan comes in a close second as our pick for the best solar attic fan. Remington Solar is another high-quality manufacturer of solar attic fans, which come with an unbeatable lifetime warranty. There are several wattage choices, and each fan has an adjustable panel and pre-installed humidistat and thermostat. These fans aren’t cheap, however, and installation can be a bit more tricky than our number one pick (but still easier than most). The Durabuild Roof Mount Solar Powered Attic Fan rounds out our top three picks as the best solar attic fan. The Durabuild is an excellent value for the quality you get. This fan comes with a quiet 24-volt motor, an industrial grade 20-watt solar panel that’s thermostatically controlled (it turns on when your attic temperature reaches 85 degrees and automatically shuts off at 65 degrees). 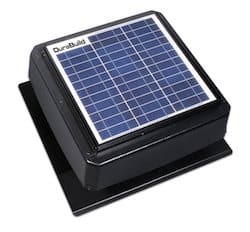 Durabuild only offers a 20-watt solar attic fan, and their warranty doesn’t come close to our top two picks. But Durabuild does give you a good value. The Brightwatts Solar Gable Attic Fan is for homes with an existing gable opening. This solar attic vent fan comes with everything you need for easy installation at an extremely competitive price. Homeowners with a small attic (less than 1,200 square feet) should find this fan adequate to pull out the hot air. However, we did find several user complaints that the solar panel isn’t powerful enough to generate enough electricity to run the fan at full capacity. And if you have a larger attic, you’ll need to purchase additional fans to get the job done. Watch the following video about our winner, Natural Light, and how their fans keep your house cooler. We created this infographic to summarize the four main reasons you should install a solar attic fan. Users of the best solar attic fans report a 10- to 20-degree drop in temperatures after installing a solar powered vent fan. Many claim their solar fans are more efficient than electric attic fans. Consider purchasing a solar attic vent fan if you’re committed to renewable energy and thinking about how you can reduce our carbon footprint. Or even consider investing in an entire solar panel system for your home. Be sure to check out our reviews of the solar pool heaters, small kits for RV’s and solar panel roof systems. Why are you considering a solar attic vent fan? Best Solar Panels For Your Home: SunPower vs SunRun vs Solarcity vs Sungevity vs Vivint Solar vs Tesla & More!